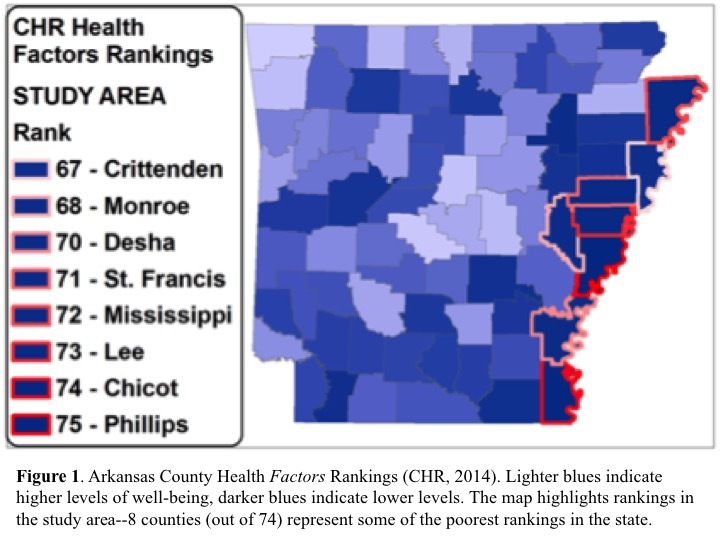 The LEAD program has partnered with the Arkansas Tobacco Settlement Commission to assist with collecting and reporting on data that evaluate current ATSC programs supporting the health of Arkansans. LEAD students and affiliated faculty are charged with conducting qualitative research to complement the quantitative evaluation component performed by faculty outside of the LEAD program. The initial round of qualitative study was focused on health and well-being in the Delta region of Arkansas. Students, with support of faculty, have worked to identify various players, projects, and programs that are working towards positive change in the Delta. The summer and fall of 2015 involved qualitative data collection via semi-structured interviews. In the spring of 2016, students wrapped up the qualitative component. Those involved in the qualitative component have presented findings at Georgetown University at the Human Development and Capabilities Association Annual Conference; the International Leadership Association Conference in Atlanta, Georgia; a conference on health disparities in Jonesboro at Arkansas State University; the Arkansas Public Health Association Annual Meeting; and at the annual meeting of the American Public Health Association in San Diego, California. In 2019, students and faculty submitted a manuscript for publication to the Journal of Health Disparities Research and Practice, and are currently awaiting feedback from reviewers.